Guar Gum is an important noncaloric source of soluble dietary fiber. One to three times daily, briskly stir one level teaspoon in 8 ounces of liquid (for children, one-half teaspoon in 4 ounces of liquid). Drink immediately, before the liquid begins to gel. Take this product with a full, 8-ounce glass of liquid. If you do not drink enough liquid the product may swell in the throat, causing blockage or choking. Avoid use if you have ever had throat or swallowing problems. Seek immediate medical help if pain, swelling or breath-ing difficulties occur. Suitable for vegetarians and HYPO-ALLERGENIC: contains no yeast, dairy, egg, gluten, corn, soy or wheat. Contains no sugar, salt, preservatives, or artificial color, flavor or fragrance. 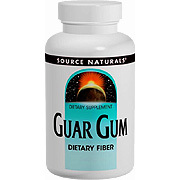 Guar Gum Powder - 8 oz is shipped in a discrete, unmarked package. Orders are processed immediately and usually take about 3 to 5 working days to be received. We do ask that you try it for 2 to 3 weeks to feel the full effects. Any information received is used only for order processing and shipping purposes. Your information, such as e-mail address, will never be disclosed to a third party.